This authoritative study of colonialism in the Spanish empire at the end of the eighteenth century examines how the Spanish metropole attempted to preserve the links to its richest colony in the western Atlantic, New Spain (Mexico), in the face of international developments. Continuing the approach in Silver, Trade, and War and Apogee of Empire, Barbara and Stanley Stein detail Spain’s ad hoc efforts to adjust metropolitan and colonial institutions, structures, and ideology to the pressures of increased competition in the Old and New Worlds. In reviewing the attempts at reform, the authors explore networks of individuals and groups, some accepting and others rejecting the Spanish transatlantic trade system. They provide accounts from both sides of the Atlantic to show how economic policy, imperial goals, and consequent social divisions and factionalism in New Spain and Spain undermined the government’s efforts at economic and political adjustments. The Steins draw on a wide range of archival material in Mexico, Spain, and France to place the waning of the Spanish empire in an Atlantic perspective. They also show how Spain came to the verge of collapse in a time of revolution and at the beginning of the transition from commercial to industrial capitalism. 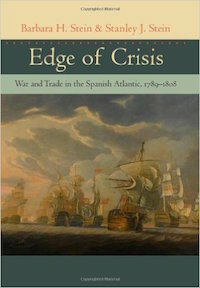 Comprehensive and carefully researched, Edge of Crisis explains the broad array of factors that led up to the French invasion of Spain in early 1808.